Some time ago I decided I wasn’t happy with my dolls having plain plastic dots for eyes. I tried painting onto the safety eyes, but the paint peeled off too easily. The problem with crochet eyes is that the stitches don’t line up squarely as they do in knitting, so counting stitches doesn’t work either. After a lot of thinking and planning I came up with a really easy was of painting crochet faces. I even threw out the paint brush for a dotting tool which allows paint to be put on the crochet more evenly and precisely. This doll you’ve seen many times I expect, she has blue eyes and sparkly pink lips. This doll has blue eyes and a more natural lip colour. His eyes are slightly closer together, which changes his face altogether. And this last fellow has green eyes and freckles. His eyes are painted looking to the side. Three different faces from the same (very) easy technique. 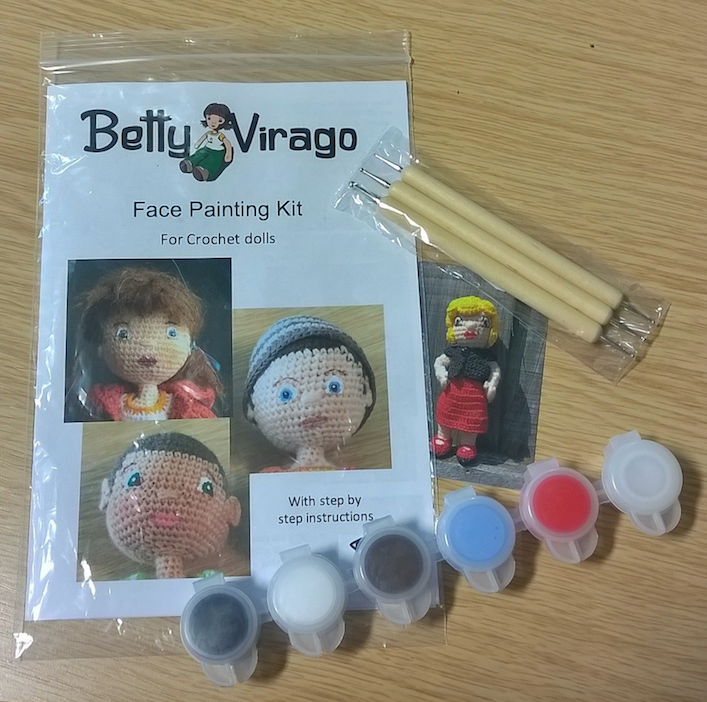 And I’ve finally put together a kit with instructions so you can also paint the faces of your dolls. The kits are already available in my Etsy shop. And for those who prefer to watch videos, one will be available very soon.